Eric and I picked a ton of berries yesterday, and had a fresh zucchini our friends the Petersens gave to us. So I was so excited to make us a delicious meal with it all. First off, a salad adapted from Taste of Home. I followed their dressing recipe, but if you notice, I changed some of the salad ingredients. I love this recipe, though next time I make the dressing, I think I’ll try it with plain yogurt instead of mayonnaise. 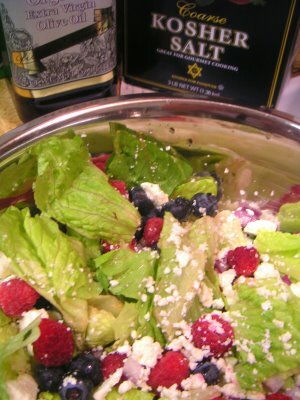 In a large salad bowl, combine the greens, berries, onion, and feta cheese. In a small bowl, whisk the dressing ingredients. Drizzle desired amount over salad and toss to coat. Serve immediately. Refrigerate any leftover dressing. Yield: 8 servings. 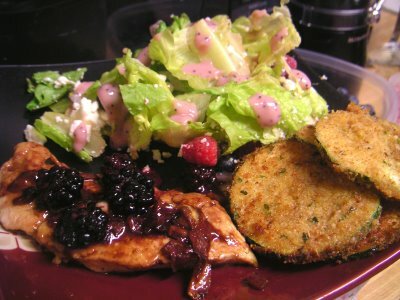 I also made up a YUMMY blackberry sauce chicken breast. I just used one breast for both Eric and I. I pounded it very thin and cut it in half. I would have preferred shallots, but didn’t have any on hand so used red onion and garlic instead. For chicken broth, I buy the huge box of chicken top ramen and use the noodles for stir fry, soup, etc. I save the seasoning packets and use those whenever I need chicken broth. Saves $$$! Flatten each breast half with the flat end of a meat pounder until thin. Before I owned a pounder, I used a rolling pin or the side of a heavy can. Heat oil in a skillet, add the breasts, and cook over medium heat until they are just starting to color, about 3 minutes per side. Remove from the skillet and set aside. Add the shallots to the skillet and cook until they are translucent, about 3 minutes. Add the vinegar, and cook, stirring occasionally, until it has reduced and thickened. Whisk in the stock and cream and simmer for 1 minute. Return the chicken to the skillet and simmer in the sauce until they are just done, about 5 minutes; do not overcook. Remove the breasts to your serving plates. Simmer the sauce gently until it has reduced and thickened slightly, 2 minutes. Add the blackberries; cook 1 more minute. Pour the sauce over the breasts and serve immediately. Finally I sliced up the zucchini into coins, dipped each one in egg, then in italian bread crumbs, and fried them in couple inches of hot oil. I served those with Ranch dressing. 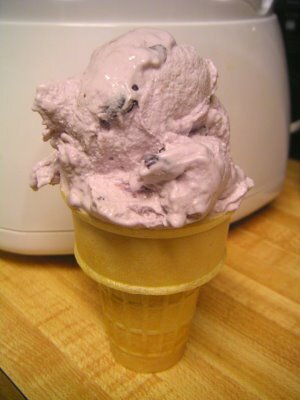 Now of course, our main purpose in berry picking, was that we wanted some fresh blueberry ice cream! I found a great recipe at ice-cream-recipes.com and was excited to try it out. Mash the blueberries with half the sugar in a bowl. Place the bowl in the refrigerator to chill while making the rest of the recipe. Pour the milk into a saucepan and bring slowly up to boiling point but do not boil. In a bowl, mix together the egg yolks and sugar until thick. Pour the milk into the mixture of egg yolks and sugar while stirring. Pour the mixture back into the pan and heat gently, stirring until the custard thickens. REMEMBER: DO NOT BRING TO THE BOIL OR IT WILL PROBABLY CURDLE. When you can see a film form over the back of your spoon it’s time to remove the saucepan from the heat. refrigerate or put in the freezer to cool. When cool, stir in the cream followed by the mixture of mashed blueberries and sugar. Transfer the complete mixture into an ice cream maker and follow the manufacturer’s instructions. All in all, I loved the whole thing. I would just change the dressing a little to not be so mayonnaisey. Eric didn’t like the mayonnaise either, and doesn’t seem to like homemade ice cream eithe. Every time we’ve made it he thinks it’s to rich and thick. May try a different kind of recipe next time, but hey, that’s more blueberry ice cream for me! We both LOVED the chicken though. Love it! Great minds think alike!